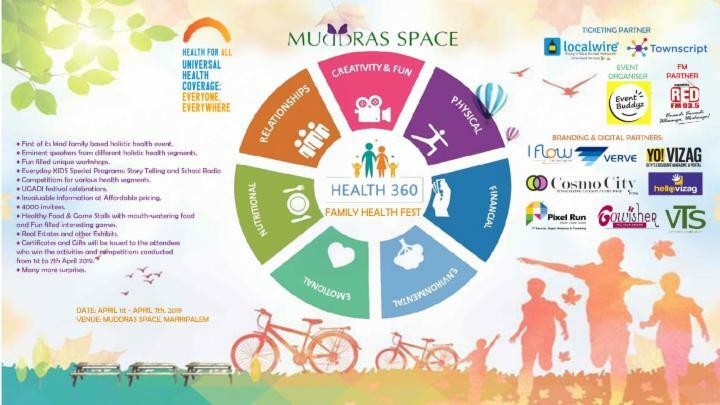 > First of its kind family based holistic health event. > Eminent speakers from different holistic health segments. > Fun filled unique workshops. > Competitions for various health segments. > Invaluable information at Affordable pricing. > Healthy Food & Game Stalls with mouth-watering food and Fun filled interesting games. > Real Estates and other Exhibits. > Certificates and Gifts will be issued to the attendees who win the activities and competitions conducted On 7th April 2019. "ON THE GO ACTIVITIES IN DAY TO DAY LIFE" by Ms. JYOTHIRMAYI M, Founder of WINGS FOR LIFE Foundation. "Express in Cartoons" by Mr.HARI VENKAT, A well noted cartoonist, works for many newspapers and magazines as a freelance political and social cartoonist. Launch of yearlong holistic health program "LITTLE HEARTS INTEGRATIVE WELLNESS" in schools, Certificates & Prizes distribution, Closing ceremony. Lets together celebrate our WORLD HEALTH WEEK with a fun filled valuable learnings of real health. This year WHO is focusing on UNIVERSAL HEALTH, please take your part in this big vision by promoting holistic health in our society.